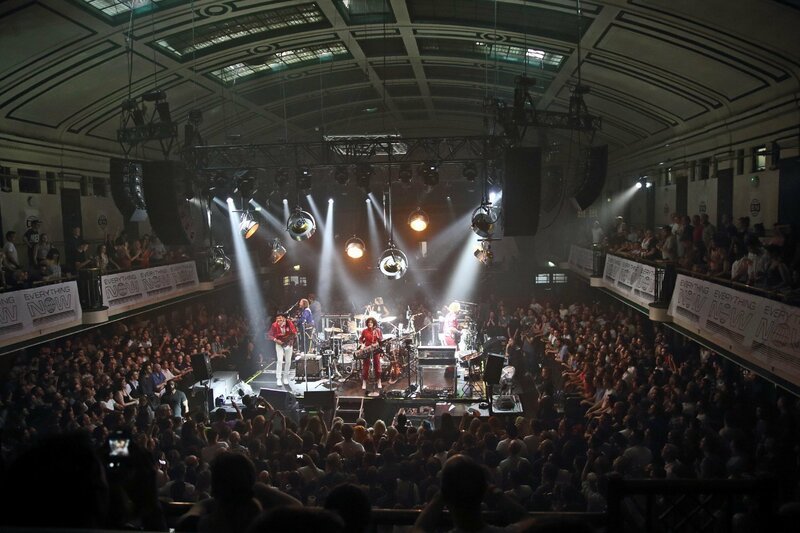 Arcade Fire and boxing were two things I never would have put together until I arrived at York Hall on Tuesday night. If you don’t know, and I’d be more than mildly surprised if you did, York Hall is a leisure centre-slash-boxing venue in London’s Bethnal Green. It has a capacity of just over 1000 people. And I saw 13 year established indie-rock heavy weights Arcade Fire play there. A boxing ring is a strange place for a gig. The band being in the middle rather than at one edge makes for a very different atmosphere, a shift in focus. The crowd, which was small anyway, is dispersed around four different stage fronts, meaning everyone was close, and that everyone had a front row spot. It’s a kind of unique intimacy that can only be created by playing in the round. 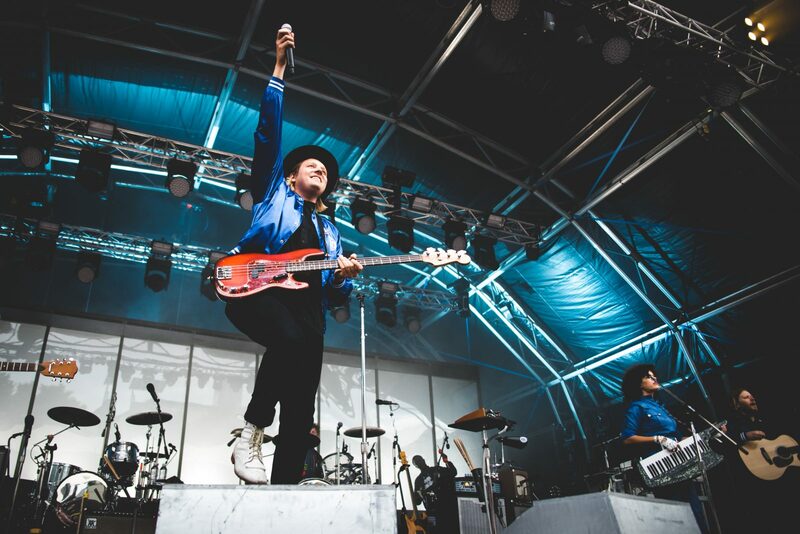 Because every member of Arcade Fire is almost sickeningly talented, they jumped from instrument to unconventional instrument, rotating around the stage like Everything Now branded clockwork. 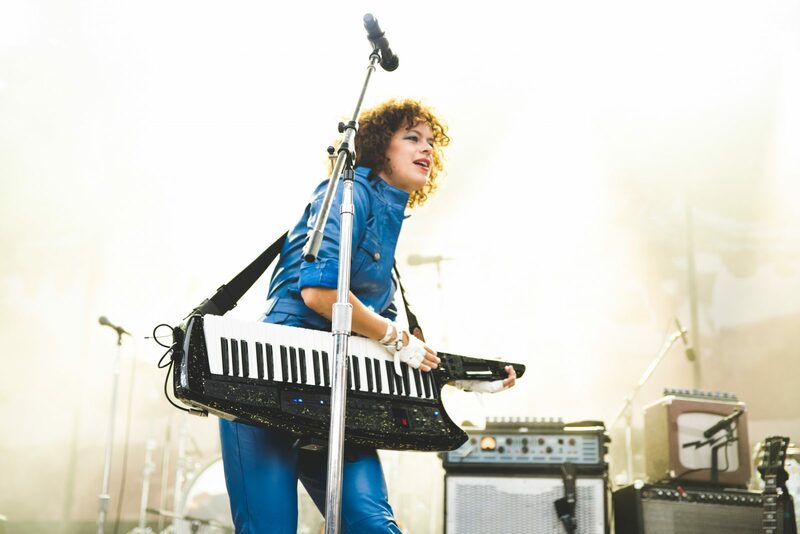 Everyone got a little piece of Win as he bounced from the stage to atop an amp, a little piece of Régine as she switched maddeningly from piano to xylophone to accordion and back again. The stage was flooded with light from every direction, making it into a gig of high drama, while you were bathed in sound being projected from all four corners. Of course, they opened with my song of the summer, of the year, of life, ‘Everything Now’, a euphoric abba-esque banger that highlights the dark side of our consumerist culture, topped off with a cracking riff and a panpipe. 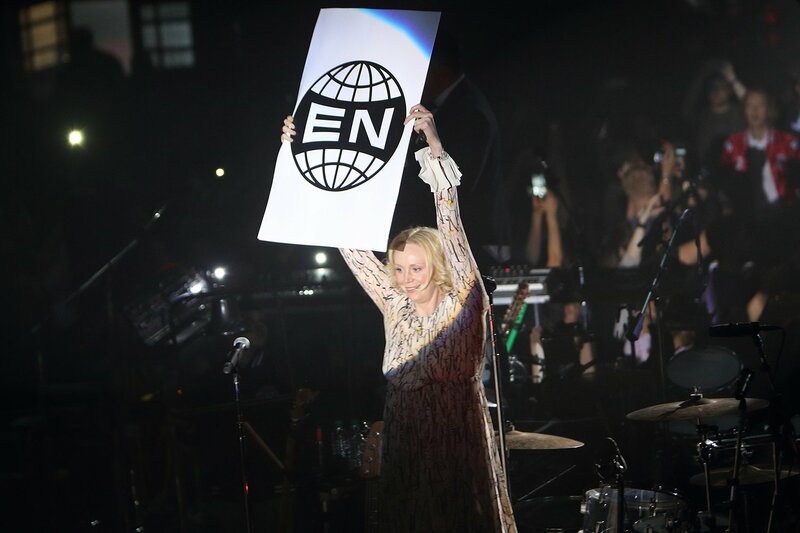 These shows are pre-empting the release of Arcade Fire’s fifth record Everything Now which will bless us later this month, and everything is EVERYTHING NOW. 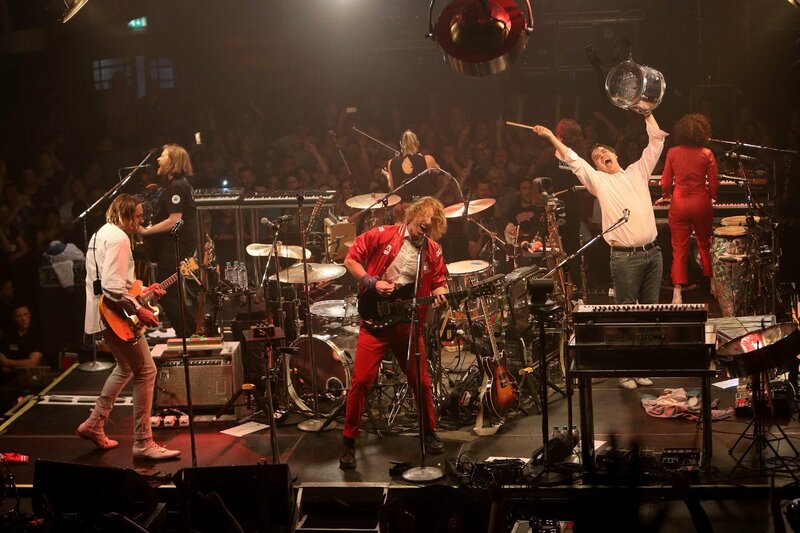 Drum skins, the bands outfits, roadies’ shirts and the front of the venue were all emblazoned with a globe with meridians, common symbol of internationalization, and a giant ‘EN’. 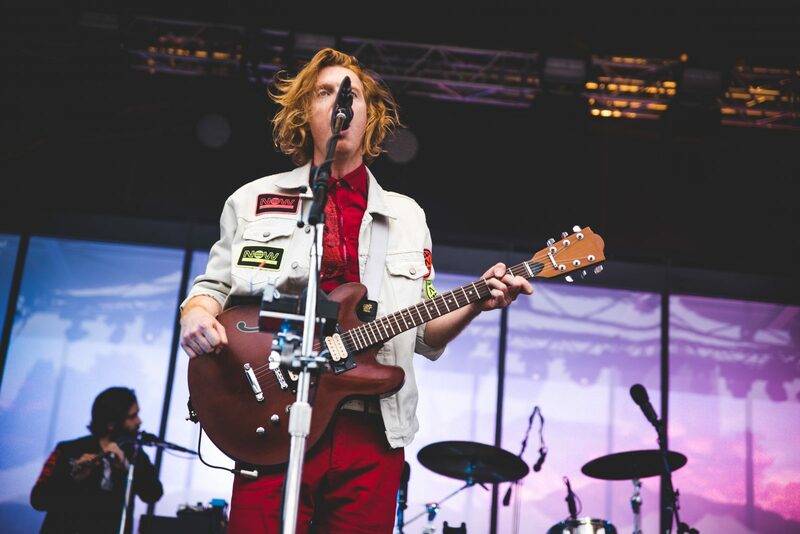 Everything Now has become Arcade Fire and Arcade Fire is Everything Now. It’s taking the piss out of modern consumer life, but is a marketing campaign so immersive and ironic that it’s hard to know where the joking stops and the serious starts. It’s so good, in fact, that it uses a backlash against consumer culture to encourage people to consume. They’re taking the piss of us having too many things, but people are dying to get their hands on an Everything Now shirt. From brand new to age old, they moved on to ‘Rebellion (Lies)’ and ‘Neighbourhood #2 (Laika)’ from debut album Funeral. Every Arcade Fire song is something special, but seeing these early tracks live, as well other Funeral and Neon Bible tracks later on in the set, was almost surreal after so many years of hearing them on record. Everyone knew every word and it was obvious that the band knew how special these songs were for the crowd. So many people there had probably grown up with these songs, had embarrassing pre-teen experiences to these songs, had worked through the confusion of life 13 years ago with them and were being transported back by seeing them live. They then moved straight on to the wonderfully-riffed ‘Here Comes The Night Time’ before playing a brand new track, ‘Chemistry’ and the recently released and extremely sassy ‘Signs Of Life’. The transitions between songs were unbelievably smooth, with some level of music being pretty much constant throughout the 1hr45 set, even when Win was having a very minimal chat with the crowd. 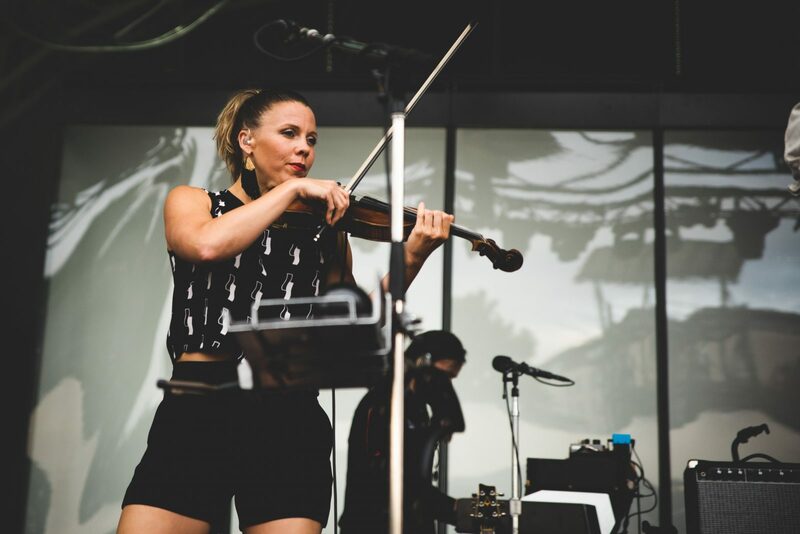 By getting the crowd singing instrumental riffs during transitions, we were enchanted the whole way through. There was no silence to break the Arcade Fire spell, no awkward reshuffling of band members while we waited, despite the aforementioned instrument swapping. This is especially impressive given the level of variety in Arcade Fire’s body of work – two songs can be polar opposite in sound and vibe and sound absolutely fantastic next to each other. Melencholy ‘Neighbourhood #1 (Tunnels)’ was followed by the anthemic ‘Sprawl II’, which was in turn followed by moody number ‘Reflektor’, and it just worked so goddamn well. 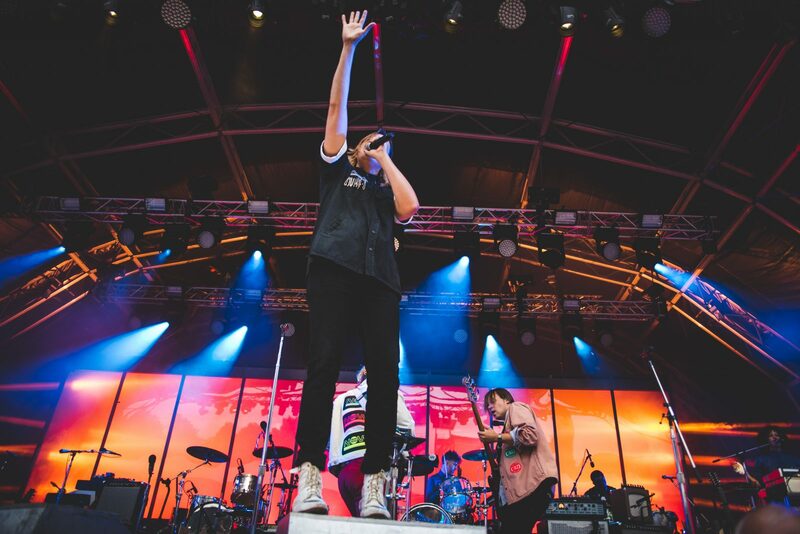 With six core members and another six additional touring members, it was a stage at full capacity, but the band’s energy was not quelled. 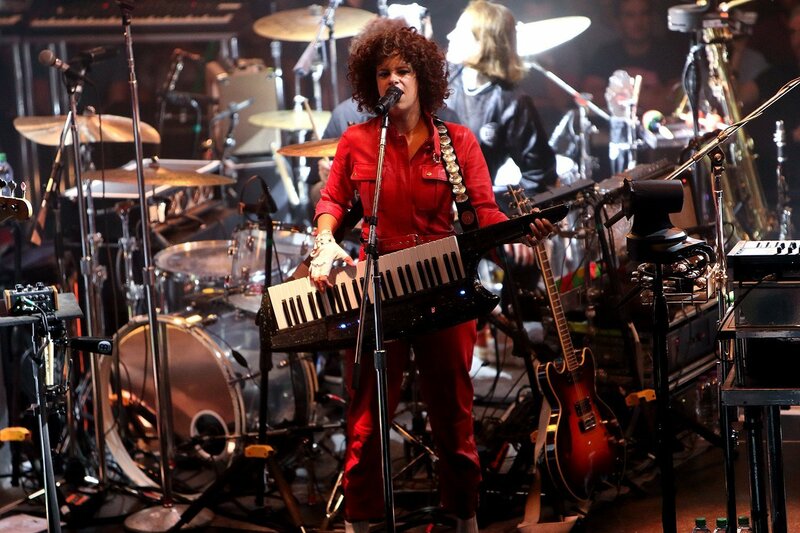 York Hall was a sweat-box, with no air-con and very little ventilation, but that didn’t stop Régine dancing around the stage in a bright red leather jump suit, smashing the steel drums or slamming the piano. 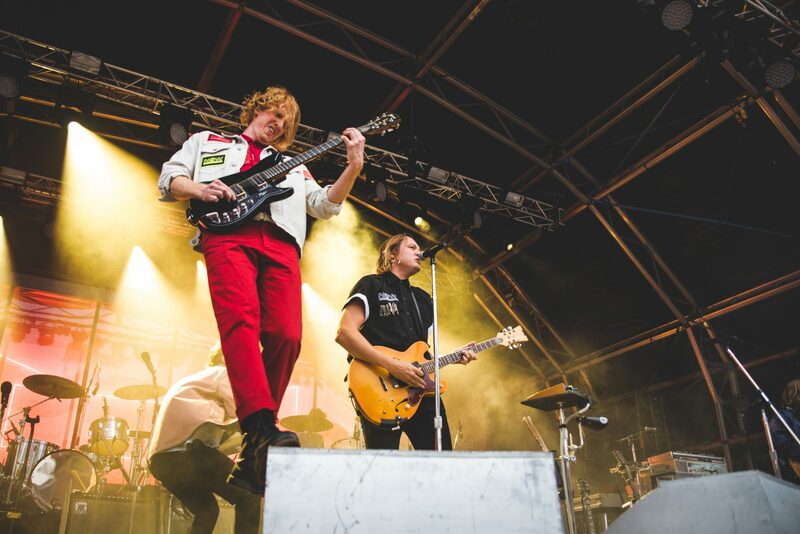 Win jumped from stage edge to speaker top, where he sung with his fist raised, while sometimes-guitarist Richard Reed Parry sung to our side of the crowd, looking like he was having the time of his life. It was incredible in so many ways, it’s hard to over-exaggerate it. The setting, the set-list, the sheer energy, being so close to a band I love so much. 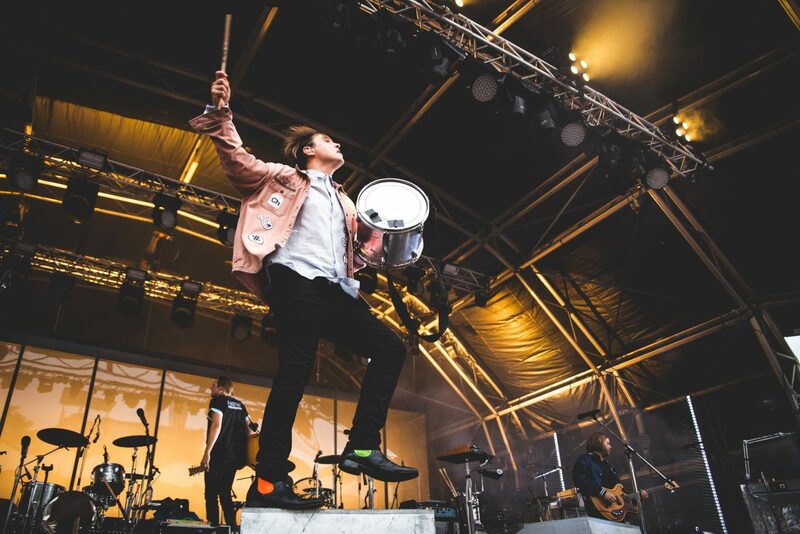 A band who have played stadiums and headlined festivals were playing to a lucky 1000 of us who just happened to be in the right place in the right time to get tickets. I never have and I doubt I ever will have another gig experience like it. After their encore, ‘Wake Up’ from Funeral, the crowd almost refused to leave. Screaming for ‘ONE MORE SONG’ for a good ten minutes after the band had said goodbye for real, no-one seemed sure whether Win was hiding somewhere ready to re-appear just when we let our guard down. He never did, but the crowd’s unwillingness to leave when sweat was literally falling in droplets down every face is a testament to the power of Arcade Fire. From down south to up north. What a band, what a blessed crowd we were.